We recently reported on the smaller electric BMW i3, and now BMW has finally released some details about the much sportier BMW i8 (protoype pictured). BMW says the plug-in hybrid i8 does 0 to 60 mph in 4.5 seconds and has a top speed of 184 mph. It is also claimed that the car achieves an impressive 95 miles per gallon, presumably not attempting that kind of acceleration on a regular basis. 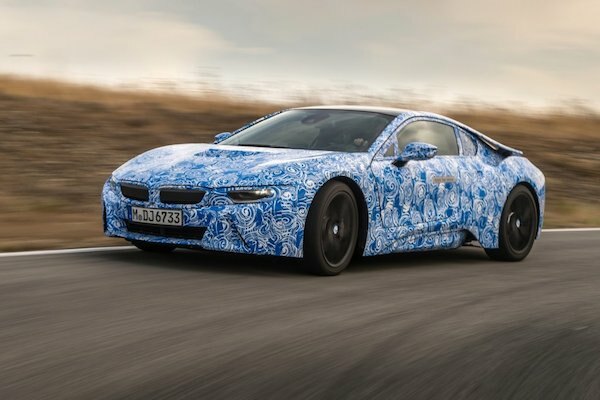 It has been a long four years since the BMW i8 was first revealed as a concept car, but apparently the final production car will be debuted at the Frankfurt Auto Show in September. The i8 to be released has a 1.5 liter, 3 cylinder turbocharged engine that delivers 228 horsepower to the rear wheels. It has a six-speed automatic transmission. In addition, a 129 horsepower electric motor drives the front wheels, and the two systems can work together or separately. When both work together, the car can achieve 357 horsepower with 420 ft-lbs of torque. The car carries a lithium-ion battery pack for the electric motor, which has enough charge for up to 22 miles (35 km) of electric-only motoring. Interested? The starting price is estimated at about US$120,000.